Hundreds of garlic-loving Lebanese came together on Saturday to make the largest hummus serving on the world's biggest plate, claiming ownership of the dish with a new Guinness world record. The previous record was held by an Israeli company. A Guinness representative was on hand to certify the record set by 250 Lebanese chefs and their trainees, who joined efforts to mix over two tons of the chickpea-based dip. 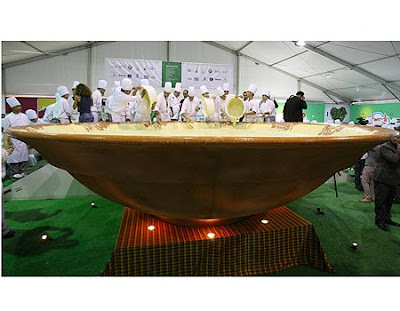 Under the watchful eyes of the adjudicator, they poured 1,350 kilograms (2,976 pounds) of mashed chickpeas and 400 liters (13,525 ounces) of lemon juice into the mega-sized pottery dish, cheered on by hundreds of onlookers. The chefs gathered around their dish upon receiving the Guinness certificate and sang an a capella version of the national anthem before joining hands to dance the traditional dabke in celebration. Organizers have hailed the event as "a patriotic event of national scale. "El Hommos Lebnaneh (Hummus is Lebanese) is an attempt to break the current Guinness world records of hummus and tabbouleh, reaffirming the Lebanese proprietorship of these two dishes," said a statement issued by the industrialist association and food syndicate, which planned the event. A battle over hummus and tabbouleh between Lebanon and Israel - two neighbors still technically at war - emerged last year and efforts have been underway ever since to clearly identify such dishes as exclusively Lebanese. The official awards ceremony is set to take place Sunday evening, when Lebanon hopes to break another world record for the largest bowl of tabbouleh. In August, the small northern town of Ehden gained an entry in the Guinness Book of World Records for producing the largest ever kebbe - a dish of minced meat and cracked wheat. Photo above and it's copyright belongs to AP. Talk about Blasphemy. I noticed the world wide web is full of recipes for Hummus Pizza. Hummus is room temperature and goes with nothing but Pita bread - so the idea of burining it in a Pizza oven is too wierd for me. But then again, maybe I should be more open. "This pizza uses hummus instead of the usual red sauce - a unique and healthy pizza for those bored with the traditional. Top with your favorite veggies and cheese."